"After several months of in-depth research and, at first, seemingly unrelated conversations with former high-level intelligence officials, lawyers, politicians, religious figures, other investigative journalists, and researchers, I can now report on a criminal conspiracy so vast and monstrous it defies imagination. Using “Christian” groups as tax-exempt and cleverly camouflaged covers, wealthy right-wing businessmen and “clergy” have now assumed firm control over the biggest prize of all – the government of the United States of America. First, some housekeeping is in order. My use of the term “Christian” is merely to clearly identify the criminal conspirators who have chosen to misuse their self-avowed devotion to Jesus Christ to advance a very un-Christian agenda. " Check out "The world in the palm of their hands: Bilderberg 2005" from Online Journal. "Charleston, S.C.-- The Sun, a British tabloid that published pictures of imprisoned, former Iraqi leader Saddam Hussein in his underwear may have missed something more intriguing than Saddam's BVDs. While the `Butcher of Baghdad’ has long been a stone around the neck of his own people, it is ironic to consider that sorcerers say he wears one of their stones around his own neck." "Muzafar Avazov, body showed signs of burns on the legs, buttocks, lower back and arms. Sixty to seventy percent of the body was burnt, according to official sources. Doctors who saw the body reported that such burns could only have been caused by immersing Avazov in boiling water. Those who saw the body also reported that there was a large, bloody wound on the back of the head, heavy bruising on the forehead and side of the neck, and that his hands had no fingernails." A new web forum for Canadians concerned about the seeping surveillance in the happy little gulag of the north. "Micro or macro? The little telltale bit of information...or the big picture? You never know which is worth looking at. Most of the "news" is merely noise. It is a distraction; it is diverting...a form of entertainment. Usually a waste of time. The Dow goes up. The Dow goes down. Housing starts increase...or they decrease. There are so many weedy facts in the daily news; it's almost impossible to see the whole lot. Still, you never know what you might find. Houses in California are still rising at 15% per year - a rate five times faster than consumer prices. That trend will come to an end, but it didn't end yesterday." "An attack by extreme-right Jews on the Temple Mount would trigger a large-scale war between Israel and the Muslim world, former Shin Bet chief Carmi Gillon told Haaretz.com readers on Thursday. During an Haaretz Q&A session responding to questions from readers, the former head of the domestic security service said far-right militants now pose serious threats to mosques in Jerusalem's Temple Mount compound. " Check out this piece from Raiders News. (U-WIRE) -"He causeth all, both small and great, rich and poor, free and bond, to receive a mark in their right hand, or in their foreheads: And that no man might buy or sell, save that had the mark, or the name of the beast, or the number of his name." Those are words from the book of Revelation in the Bible. With the passage of the Real ID Act recently in the U.S. Senate, those words might soon become more meaningful in each of our lives. What kind of a world does the elite plan for you? Since 1954, the Bilderberg group, with the collaboration of the mainstream media, has been meeting in secret, behind closed and heavily guarded doors, to make decisions affecting virtually everyone on Earth. U.K. Economy - headed for a fall? "As one economist, David Smith of the stockbroker Williams de Broë, put it: "One issue that was not addressed in the election campaign was why a Labour government with a massive majority needed to go to the country a year before its parliamentary term has run its course. One possible explanation is that Labour's alleged economic achievements represented the construction of a Potemkin economy and that this wobbly structure is starting to reveal its underlying flaws." Washington, DC, May. 18 (UPI) -- A German official Wednesday said reports that Condoleezza Rice was against Germany becoming a permanent member of the U.N. Security Council were not serious. Volker Ruehe, a senior politician who is Chancellor Gerhard Schroeder's special envoy for U.N. reform, was commenting on a report in Wednesday's Washington Post that the Secretary of State had said "there was very poor rationale for giving another member of the European Union a permanent seat" in the Security Council. "Leaked documents obtained by The Independent reveal that the German government took the controversial decision to eject thousands of Roma refugees and other minorities in November of last year, regardless of the risks they may face on returning home. At a meeting of German state legislators, officials made it clear to central government that the Roma were unwanted and should be deported as soon as possible, starting with those costing the state money in welfare payments." "The Nazis judged Roma to be "racially inferior," and the fate of Roma in some ways paralleled that of the Jews. Roma were subjected to internment, forced labor, and massacre. They were also subject to deportation to extermination camps. Einsatzgruppen (mobile killing units) killed tens of thousands of Roma in the German-occupied eastern territories. Further, thousands were killed in the Auschwitz-Birkenau, Chelmno, Belzec, Sobibor, and Treblinka extermination camps. The Nazis also incarcerated thousands of Roma in the Bergen-Belsen, Sachsenhausen, Buchenwald, Dachau, Mauthausen, and Ravensbrueck concentration camps." Just how gay is America's right? NY Times: Just how gay is America's right? generated $1 billion in kickbacks on jobs never created. We note the RCMP launched 12 kickback investigations into HRDC; three related to awards in former Liberal prime minister Jean Chretien's family riding of Saint-Maurice. "Conspiracy Theory Rock" by Robert Smigel was shown on "Saturday Night Live" during the March 14, 1998 broadcast but edited out of reruns. Canadians ought to realize that this week's breakdown of their Parliament is far more serious than any of the thuggish revelations from the Gomery Commission. As of this weekend, we are in the historically unprecedented situation of having a Prime Minister who is clinging to office by recklessly disregarding the fundamental principles of our democracy. It is a shocking act of proto-tyranny, which justifies the extreme resort of intervention by the Governor-General. I am not writing this lightly or with any knowledge of or involvement in any party's strategy. Nor do I think that most Canadians understand or perhaps even care about the complexities of the constitutional imbroglio that has unfolded since the opposition began defeating the government in the Commons last Wednesday. Canada this weekend has a government clinging to office against the repeatedly expressed wishes of a majority of the democratically elected members of the House. In some countries at some times in their history, a situation like this would lead to citizens taking to the streets in protest. Instead, even those Canadians who notice the situation are content with the thought that it will probably only last until Thursday. Surely a few days of unconstitutionality can't matter. But they do matter immensely, both for their immediate implications, and as precedent. The defeat of the Martin government on Tuesday came on a procedural, not a confidence motion, but it was such a clear sign that a majority of the House of Commons do not support the government that virtually all constitutional experts are agreed that an immediate test of the House's confidence was required. Instead of doing this, the government proposed a nine-day delay, offering reasons for the delay so transparently bogus as to affront the intelligence of a 10-year-old. The British Columbia election has nothing whatever to do with the affairs of the Parliament of Canada. The visit of the Queen, a constitutional monarch whose activities are absolutely ceremonial and apolitical, cannot possibly in the 21st century take precedence over the need to resolve an impasse in our elected Parliament. Paul Martin had a constitutional and moral responsibility to ascertain the confidence of the House of Commons on Wednesday. When he failed in this responsibility he was thumbing his nose at the conventions of responsible government and modern democracy. His government continued to disregard their constitutional responsibilities on Thursday and yesterday, leaving a frustrated opposition to demonstrate its lack of confidence repeatedly by taking control of parliamentary affairs in one vote after another. A government that has been shown to be unable to govern has stated that it will continue to stand in contempt of Parliament for the first three days of next week, but will finally face an explicit test of confidence on Thursday. The problem with this strategy is that the unconstitutional delay in scheduling the vote of confidence saps it of its legitimacy. If the ministry, which is also manipulating all the levers of power every day it clings to office, wins the vote on Thursday the opposition will have every right to cry foul and continue to contest the government's legitimacy. It will almost certainly paralyze Parliament. At the very least the government's strategy is creating parliamentary bitterness and distrust such as we have never seen in the modern history of Canada. At worst, we are creating the kinds of precedents involving the erosion of our Constitution that in other countries have been initial steps on the road to dictatorship. Watching events unfold this week, I have been astonished at the way in which a combination of partisanship, ignorance of the Constitution, and Canadian complacency have blinded many in government and the media to the seriousness of the crisis. The opposition is partly to blame, for they ought to have taken their concerns officially to the Governor-General as early as Wednesday, when it became apparent that the government would not respect the conventions of responsible government. The Governor-General cannot intervene solely on her own initiative, but if she receives a request to intervene from the leaders of the parties that are daily demonstrating their control of the House of Commons, she can and must act. It has been reported that Mr. Harper and Mr. Duceppe have decided to appeal to Governor-General Clarkson. If they do, she has a clear duty to take note of the situation in Parliament and request that her Prime Minister seek the confidence of the House at the earliest opportunity, which is Monday. If he refuses to do his, the Governor-General ought to make known to Parliament her displeasure -- a step that would almost certainly have an immense effect on public opinion. It's possible that all of this will be settled this week, either by compromise or by vote, which will lead to the calling of an election, which we hope will clear the air. En route to the election, huge damage is being done to constitutional government and democracy in Canada, and if there is not an election, the situation will spiral into an even more alarming vortex. I am not sure that Canada has ever had such a serious parliamentary crisis. Perhaps it is comparable to the Pacific Scandal of 1873, when the Governor-General did intervene to suggest that the Prime Minister consider resigning as his parliamentary support dwindled. Who would have believed that history could possibly come close to repeating itself in the year 2005? The fact that few Canadians understand or appear to care about the seriousness of this situation is in itself a sign of the erosion of the civic culture that has to underpin a healthy democracy. Yesterday in Ottawa, the Opposition motioned to dissolve Parliament in a vote of non-confidence 153 to 151, but the Liberal government has stated that the vote was on a reccomendation to a committee that there be a vote of non-confidence. Basically, the Liberals are holding onto power by a technicality. The Elected representatives have expressed their view that the government should be dissolved, but the reigning party has ignored it - why? Why are the Liberals trying to buy time? They are only delaying the inevitable - the downfall of the government, so why cling to power so desperately? Do the Liberals have some trick up their sleeve? Prime Minister Martin has stated that he will table his budget on May 19th and that this will be a vote of confidence. Why is that? Canada's government could fall just as the Queen of England pays a visit to the provinces of Saskatchewan and Alberta. The Queen is scheduled to visit Canada from May 17th to the 25th. The Queen is Canada's official head of State, and perhaps Paul Martin is waiting for her advice concerning which actions to take before and after this vote of confidence. Both Martin and the Leader of the Official Opposition, Stephen Harper, are Bilderbergers, so maybe it doesn't matter which government is in power - or does it? About the only way the Liberal government could maintain power and bypass an election is to call in a state of emergency under Canada's Emergencies Act. With all the manoevering done by the Liberal government to maintain whatever shred of power it has, why is it delaying the inevitable? Does the government have some dirty trick up its sleeve? Docters van Leeuwen, Arthur W.H. Senior Fellow, Hudson Institute, Inc.
President and CEO, Indigo Books & Music Inc.
Chief Executive Officer and Managing Director, Enel S.p.A.
Chairman, Goldman Sachs International; Chairman, BP p.l.c. "You know it's getting bad when even World Net Daily questions who President Bush's god is." CLICK HERE to read Pepe Escobar's latest. 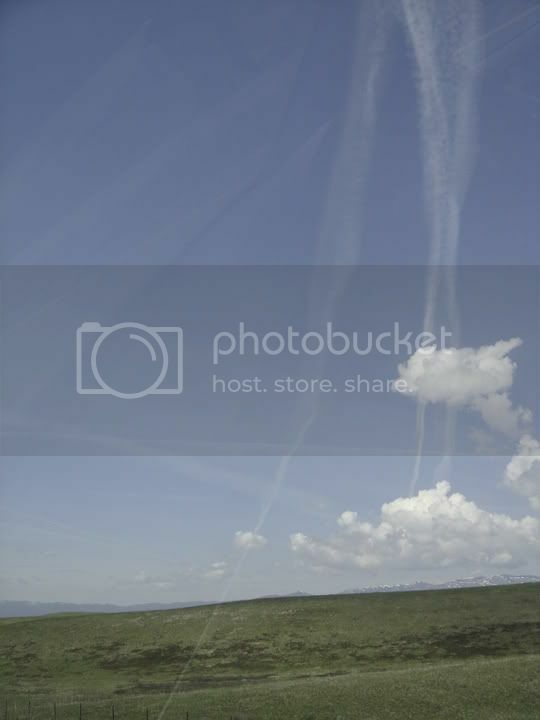 Bilderberg 2005 has - coincidentally? - merged with Bush's tour among his Baltic friends and the tense meeting with Russian President Vladimir Putin. The containment of Russia was likely top of the agenda for Bilderberg. Russia is very much worried about its "near abroad" and sees no reason to remove its army from bases in Georgia or its navy from Sebastopol, in Ukrainian Crimea - no matter how many color-coded revolutions happen at its doorstep. 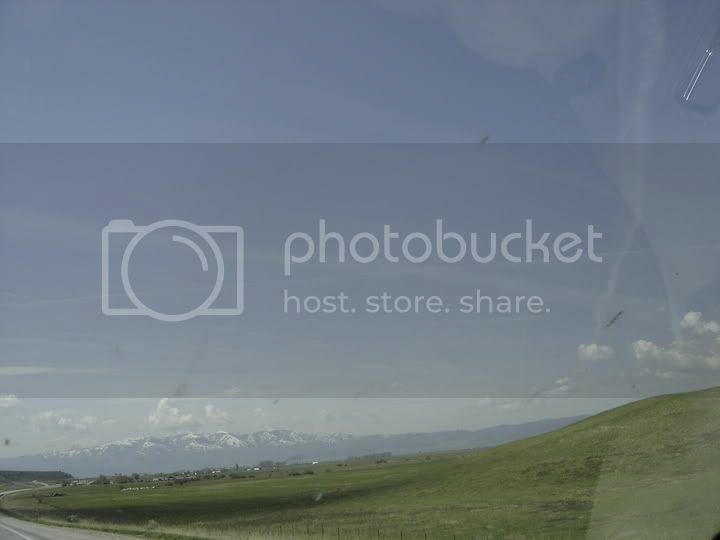 I took these while driving through Utah back on April 27th. 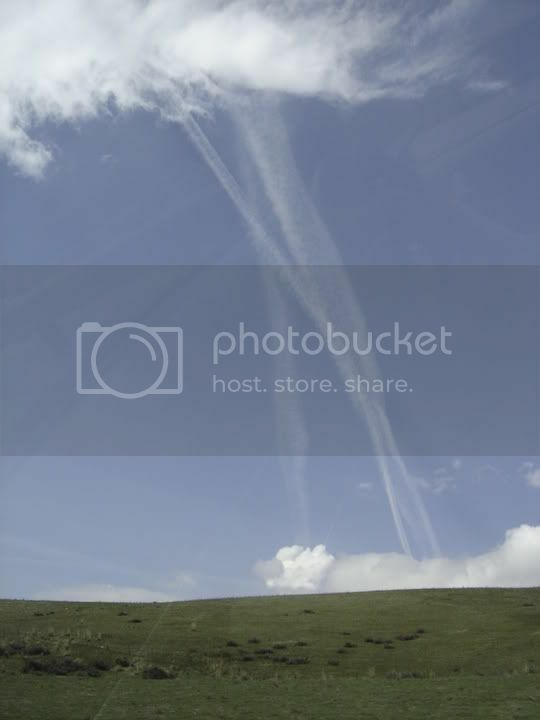 Might be chemtrails, might not be. From Propagandamatrix.com comes THIS video. I just don't know what to say. WE seem to be living in apocalyptic times. On NBC's "Revelations," Bill Pullman and Natascha McElhone seek signs of the End of Days. In the Senate, gray-haired eminences speak of the "nuclear option." The doomsday theme is seeping into the normally circumspect world of economics. In April, Arjun Murti, a veteran analyst at the investment bank Goldman Sachs, warned that oil could "super-spike" to $105 a barrel. And increasingly, economists are prophesying that the American economy as a whole may be sailing into choppy waters. Just look at the many obvious and worrisome portents. The government each year spends much more than it brings in, and so the nation has a large budget deficit ($412 billion in fiscal 2004, and growing). Americans also import far more goods than they export, and so the nation has record trade and current account deficits. As consumers, Americans personally spend significantly more than they earn. Worse, some imbalances are eerily reminiscent of conditions that helped touch off recent economic crises: Mexico in 1994, Asia in 1997, Russia in 1998 and Argentina in 2002. Throw in rising interest rates, warnings of a housing bubble and the potential for higher inflation and slower growth (a k a stagflation) - and you can understand why some economic analysts may be plumbing the New Testament for inspiration. What do you get when you combine nose-diving military enlistments with a bleak assessment from the Pentagon's top brass that the ongoing Iraq-tastrophe hampers U.S. military readiness -- leaving the nation perilously short handed in the face of North Korean and Iranian provocation? The answer: A lot of nervous-twentysomethings. Meantime back on the farm as the saying goes in Texas, what does Uncle Sam himself blithely do with the world's hard earned savings and money? His consumers still over-consume it without 99. 9 percent of them knowing what they are doing, since hardly anyone tells them so. And Uncle Sam's government uses much and all of its increase of hundreds of B$ for the Pentagon. That money is not spent to pay its poor professional soldiers who come mostly from small town rural America and took the only job they could get, and even less is spent on its hapless reservists. They told Rummy in Kuwait that he does not even provide them with sufficient and safe equipment. Rummy replied, I am an old man, I just got up, and I need time to get my thoughts together. But at home in the Pentagon, Rummy faces no such problem. There he knows very well what he is doing, privatizing war also in Iraq as at home. The Military-Industrial Complex against which General Eisenhower warned in his 1958 parting Presidential address is alive and kicking, more than ever under the stewardship of "Vice" President Cheney and his De[a]fSec Rumsfeld. With their jobs disasterously well done, both are being kept on for a second term. So is Paul Wolfowitz "of Arabia" who with Douglas Feith is one of the duo at the Pentagon that went to Israel. Regarding the latter, the German Der Spiegel Dec 20,2004:33 quotes Tommy Franks, who was the commander of the Iraq invasion, as calling "the greatest total idiot that there is on God's Earth, with whom I have to battle almost every day"]. Via this post from Jeff Wells, check out the RCMP's latest commentary on the topic of Satanic Ritual Abuse. Those articles will make your skin crawl. YELLOWSTONE NATIONAL PARK, Wyo. - The Yellowstone caldera has been classified a high threat for volcanic eruption, according to a report from the U.S. Geological Survey. Kilauea in Hawaii received the highest overall threat score followed by Mount St. Helens and Mount Rainer in Washington, Mount Hood in Oregon and Mount Shasta in California. Check out this excellent piece by Jeff Wells at Rigorous Intuition. Thanks Jeff, for your wonderful insights. Keep up the great work.